The statue landscape of Hellenistic cities and sanctuaries was constantly changing, but the process of the gradual accrual of statues is customarily elided on site plans, which tend to show—if they represent statue bases at all—the final phase of this long and complex process. Investigating the way statue landscapes developed over time can provide a better understanding of the political, social, and spatial dynamics at play in portrait dedication. 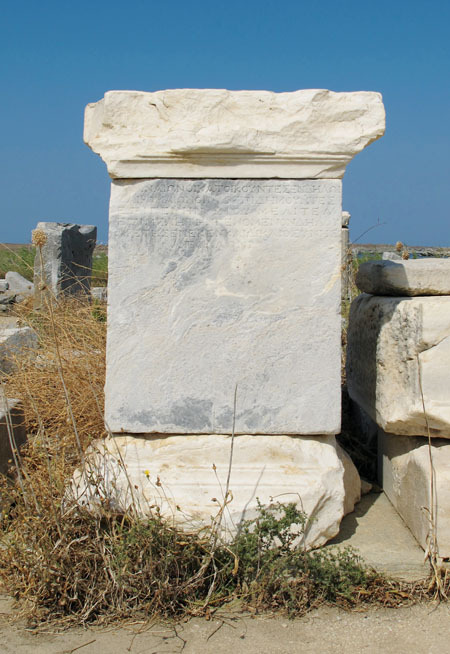 This article takes as a case study for such an approach the portrait statue monuments set up along the dromos of the Sanctuary of Apollo on Delos. Our aim is to unpack the processual dimension of this statuary display by representing this process visually through phase plans and a three-dimensional model of the dromos made in Trimble SketchUp. Parsing into phases the gradual accumulation of statues along the dromos reveals the historical dimension of statue dedication and exposes the tensions between individual and group identity that could be negotiated visually through the location, material, and size of a portrait monument. Finally, we argue that imaginative reconstruction can help us think through the implications of display context for sculptural style: the ever-increasing number of portrait statues in the Late Hellenistic period may have been a driving force behind the stylistic changes that occurred in Late Hellenistic portraiture. This hypothetical 3D reconstruction shows the gradual accumulation and increasing density of statue monuments on the Delian Dromos over approximately 150 years. It is an attempt to represent the process of change over time. The authors believe this model is a useful tool for trying to gauge and interpret the visual effects of statue collocations on the ancient honorific landscape.